Yay first! And yeah, Loki doesn’t like being questioned by impertinent brats like Coal. Oh yeah, man, I’ve done it the past three years and won each time! XD It’s always a bit rough, but somehow I manage. Looks great, I love the lighting and colors on the bottom panel. Have some rest, you’ve earned it! whats jotunheim, and what other thing was he gonna refer to after he said that? does loki have two homes? Oh, whoops, I forgot to explain Jotunheim, sorry! Translated it means “Giant Land” or “Giant Home” or something along those lines. 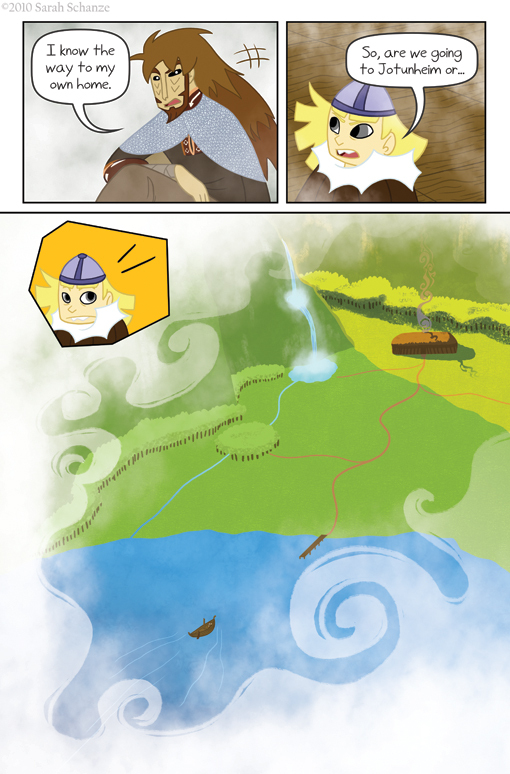 Loki is a jotun/giant, so Coal assumes they’re headed to where the other jotnar/giants live. And I don’t know where, mythologically speaking, Loki’s home is. It’s never mentioned in any source, but he flitters around between different places so much, and has a number of enemies, I gave him something of a place that is its own place. Not easy to get to if you don’t know where you’re going sorta deal. Coal is probably the cutest thing I have ever seen. Is it weird that I think Loki’s adorable, too? Thanks for the great story — I’m bookmarking you so I can keep up! Also, what a cozy little cabin. Unless it’s like one of those tents in Harry Potter where is a mini mansion inside.